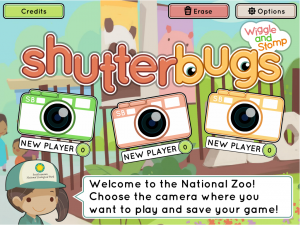 Shutterbugs Wiggle and Stomp is a free game from the Smithsonian. In it, students join a zookeeper on a tour of a zoo, and students must identify the actions of various animals. The zookeeper’s spoken words appear as text, and with adult guidance, could help students begin to make the connection between speech and text. An iPad app is also available for download. Possible uses in Georgia Pre-K: A teacher could introduce the game during a large or small group time, focusing on the actions of the animals or the words of the zookeeper. For example, when the zookeeper asks students to identify the animal that is hopping, teachers may ask students to hop. Teachers may also focus on early literacy skills by pointing out and discussing the words on the screen. After introduction and guidance from the teacher, some students could play the game independently during an independent small group time or during center time. Finally, teachers could use the game to discuss the characteristics of animals and the function of different body parts. Do you have other ideas or experiences? Share them in the comments. PDM5.4b: Demonstrates coordination and balance in a variety of activities. CLL2.4a: Demonstrates understanding of more complex vocabulary through everyday conversations. CLL2.4b: Connects new vocabulary from activities, stories and books with prior experiences and conversations. CLL8.4b: Understands that letters form words. Understands that words are separated by spaces in print. CLL8.4c: With prompting and support, tracks words from left to right, top to bottom, and page to page. SC1.4a: Uses senses to observe, classify and learn about objects and environment. SC3.4a: Observes, explores and describes a variety of plants and animals. Describes their basic needs and life cycles of living things. SC3.4c: Identifies and describes the functions of many body parts.